As a thank you to those who serve our country, County Animal Services is joining Animals for Armed Forces in waiving pet adoption fees for military members interested in adopting a dog, cat or rabbit this Memorial Day weekend. The adoption special is being offered to current, former or retired and immediate family members of those who serve in the Army, Navy, Air Force, Marines, Coast Guard and National Guard. This is the fourth time that Animals for Armed Services has invited County Animal Services to take part in the event. 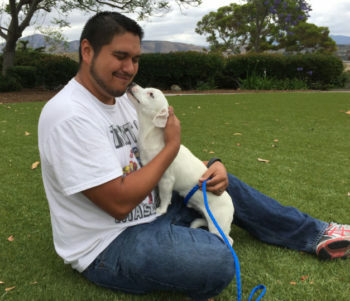 More than two dozen locations throughout southern California and Utah are waiving pet adoption fees. During the adoption special last year, nearly 100 animals from the County’s shelters were adopted into new forever homes. They all go home spayed or neutered, with current vaccinations, a microchip, a dog license and a free vet exam within the first 10 days. Qualified adopters can take advantage of the special from 9:30 a.m. to 4:30 p.m. on Friday, May 25 through Sunday, May 27 at all three County shelter locations. The shelters will be closed on Monday, May 28 in observance of Memorial Day. Military members or their families interested in adopting a new pet can get a preview of which animals might be available by visiting the County’s adoption webpage. Potential adopters must bring a photo ID and one of the following to be eligible for the fee waiver: a military ID, Dependent ID, Veterans ID, DD-214 and driver’s license or NGB Form 22. For more information about County Animal Services, call (619) 767-2675.